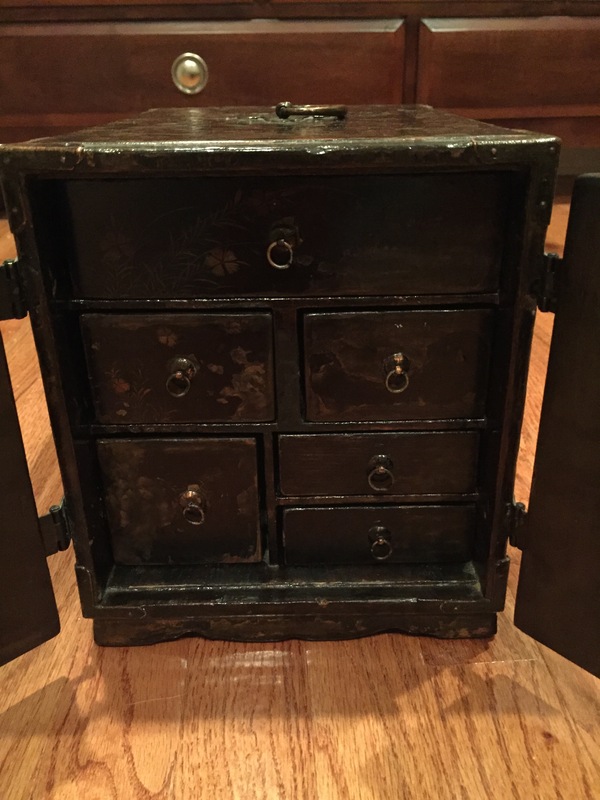 As a little girl, I remember how special I felt when I received my very first jewelry box. My magic box had a spinning ballerina and played a little tune when opened. I imagine I received that prized possession around the time I first got my ears pierced, another rite of passage for many little girls. 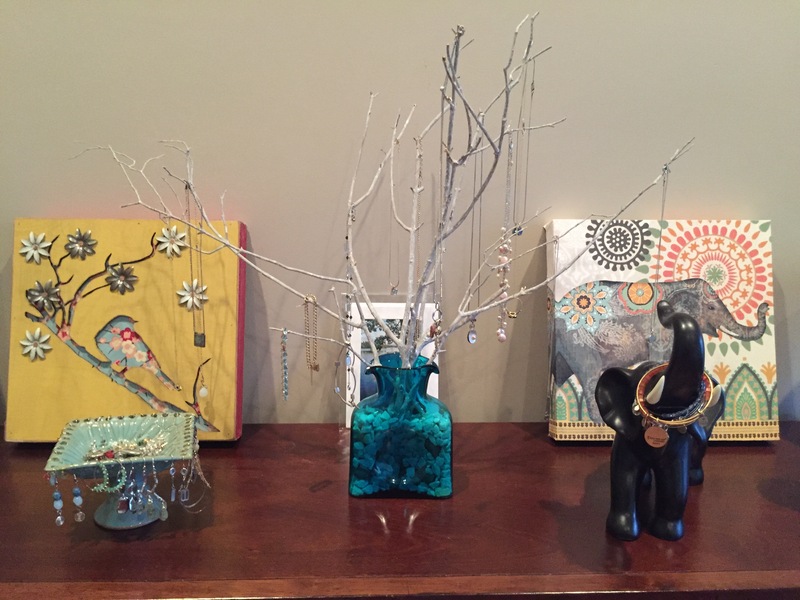 Over the years, my choice of jewelry organizers and their contents has evolved along with my love (obsession?) with boxes to contain and organize my life. I’ve often joked that i’m the opposite of claustrophobic–I LOVE a small space that contains everything I need right there. Freud would likely say it’s a throwback to being in the womb–the ultimate in warmth and safety, a space where our needs are met without us needing to even express them. As a kid I was obsessed with airplane bathrooms (so tiny and yet so functional!) and with my brother I dreamed up bunk bed designs that had walls and doors and everything we needed in an enclosed and cozy space. Why such a fascination with enclosed structures? I find it comforting to know the exact dimensions of objects and spaces. I like to know where things begin and where they end. I love compartments and drawers and places to store stuff. It puts my mind and soul at ease to have a place for everything and everything in its place. I’ve started to realize lately that this tendency towards a neat and organized life extends beyond my physical world. I yearn to apply it to my relationships, my children, my career. How lovely when the expectations are neatly laid out, and we know what measures we need to reach, and by when, in order to make the grade. I love step-by-step instructions and how-to videos, especially in areas where I have limited experience or expertise. The culture we live in today supports this trend of organizing ourselves via boxes. 36-45? Check. Married? Check. Caucasian? Check. But what about those areas that are less clear? Or what happens when the box we’re in serves to stifle us rather than support us? Looking back, there are times in my life that worked really well under clear parameters. I could wrap my brain around college: 4 years, one major, $X of financial aid. The path was well laid out with class syllabi and a core curriculum. The college experience is designed to be a time of growth and development, a stretching of wings, but all done within well-defined boundaries. I went off to Harvard prepared to have the experience of a lifetime, expecting to grow, ready to expand my horizons and broaden my perspective. I did all of that and thrived within the guidelines set forth. The Harvard “box” was large enough for me to explore adulthood and experience independence, but not too large that I got lost. As my undergraduate experience drew to a close, life got a little scary. I lined up a job for the summer immediately following graduation–I would be working at a summer program for youth in the Cambridge area–but beyond that I was at a loss. I had spent so much of my life focused on getting to Harvard (it was my dream and goal since age 6), I hadn’t considered what came next. Many of my classmates entered the world of investment banking and consulting, some went on to pursue graduate degrees or teach in other countries. I moved into my boyfriend’s dorm room (he was a year behind me in school). When I saw former classmates in Harvard Square, I crossed the street to avoid the dreaded question: “So where are you now?” If I didn’t dodge my acquaintance quickly enough, I would reply: “Oh, I stayed local.” I’m pretty sure “I share an extra-long twin bed in Winthrop House” isn’t the answer anyone was looking for from a recent Harvard grad. Fortunately, the guy I asked out over a keg two months before graduation turned out to be a good catch, and he became my partner in creating the next stage of my life. Our relationship became the “box” or structure that would continue to support and guide me. Together we moved to California, started multiple businesses, bought our first condo, adopted two cats. We created two children, shared seven different addresses, lost one home to foreclosure, danced at too many concerts to count. In 2015, we celebrated 10 years of marriage. As a family we agreed that I would stay home and raise the small humans, which can be a lonely and challenging proposition. When we moved back to New England in 2007 (eight months after our first son was born), Jerry’s company allowed him to work from home; how wonderful to have another adult human to interact with and be supported by while I was in the trenches of early motherhood. 2015 promised to bring great changes…or, rather, I started 2015 with an idea that threatened to make me uncomfortable. At 38, the only box that seems to change these days is my age. We’ve had our kids. We’ve bought the home we plan to raise our kids in. I’ve gotten used to checking the same boxes. From my perspective, there were no changes hovering on the horizon that would be profound enough to cause me to check off a different box. There are times in life when we’re on a journey and it’s easily recognized by both ourselves and the outside world. We accept the journey, we embrace it, we roll with it. College was like that for me. I imagine joining the military is like that for some people. Studying abroad, moving cross-country, getting married. All of those are journeys that we enter into with an understanding that things won’t always turn out as we expected, but that’s part of the experience. And then there are those times when we sense that we should have arrived already, dammit. I sent my little guy off to Kindergarten this year. I feel like I should be able to check a new box for that, but I haven’t come across one yet. Instead I’m forced to navigate the much more confusing question of whether or not I’m “employed.” I certainly haven’t been hanging out watching re-runs of “Small Wonder” and “Who’s the Boss?” for the last 9 years. And yet our culture doesn’t consider it “employment” when a parent steps out of the workforce to give their days and nights to wiping endless snotty noses and bums. So, back to my uncomfortable idea. By the end of 2014, I was feeling restless. Life was good, but I sensed that there was something else to reach for. It wasn’t anything that I would find by staying safely within the clearly defined and visible boxes of my life. What was there for me to discover existed in a different realm, one just outside of our vision. We can feel its presence, but until we create from that realm and move our dreams into reality, we can’t “see” the fruits of our labor. As 2014 came to a close, I stepped into that realm of the unknown, the land where we throw our hat over the fence knowing that we will then have to go pursue it. Once I allowed myself to pursue one small dream (starting my blog–I posted my first entry in September 2014), it was like I gave myself permission to pursue more and bigger dreams. I realized that, with my little guy heading off to all-day Kindergarten in the fall of 2015, I’d have some time to fill. And one thing I have learned in my 9 years as a stay-at-home mom is that if I don’t fill my time intentionally, it will get filled with things like never-ending piles of laundry and dishes. So I made a plan to pursue another dream that I had been cultivating for a few years, to get certified as an Integrative Health Coach through the Institute for Integrative Nutrition. I gave my five month notice at work and started laying my plans and dreaming more dreams. I realized that if 2015 was the year I was going to really go for it, I wanted to “up my game” in all areas of my life. Why not, right? If life doesn’t hand us different boxes to check, may as well create our own! I created a “Year of Radical Wellness” for myself…what that would look like was yet to be determined. I knew that to be radically and radiantly “well,” I would have to give up drinking for the year. My ancestors and I have a long and troubled relationship with alcohol; it seemed best just to put it aside for the time being. No need to keep anything around that may muddy the waters. January 2015 arrived, and I weighed in, logged in, took some pictures. I blogged about my upcoming adventure, did regular video updates on my phone (for myself), wrote down my experiences of the journey. I thought I was going to structure things a certain way (I do love my boxes! )…and then I realized that in the land of Radical Wellness, structure isn’t always required or desired. I gave myself over to listening to my gut, going with the flow, and being in the moment. Here we are, November 11, 2015. My Year of Radical Wellness is coming to a close. There are areas of my life I haven’t yet handled. I haven’t posted a blog entry in 3 1/2 months. I fell off the phone video update train sometime in May (I think?). Months went by without a single weigh-in. I fell behind in my Integrative Nutrition schoolwork in the summertime, and I still haven’t fully caught up. I took on more than I could handle, bit off more than I could chew, and forgot I make the rules (that’s the title to a blog entry I started and stopped a few times, couldn’t see it through to completion, maybe you’ll see it next year). And yet, here I am. As of today, I’m 17 pounds lighter than I was in January 2015. I’ve reached a weight that I didn’t think I’d see since having kids. I’m 2/3 of the way through my certification to become an Integrative Nutrition Health Coach (and I started officially seeing clients in August). In July I cut 10 inches off my hair. In September I cut it shorter and went blonde. In 2015 I created a space for myself where it was okay to not have the answers, to make mistakes, and to question my own self-imposed limitations. I’ve had to say no to some things so that I could say yes to others. Instead of walking the same old path in the same old shoes, I chose to create a new path. And I’m still going. It’s been scary at times. At times it’s been a bit rocky on the home front. From August through mid-October I was in a state of deep overwhelm, and I wasn’t the most pleasant person to be around. I haven’t always handled things with grace and ease, but that is part of the journey too. The idea for this blog post came when I completed a project I’ve been working on for the last year. 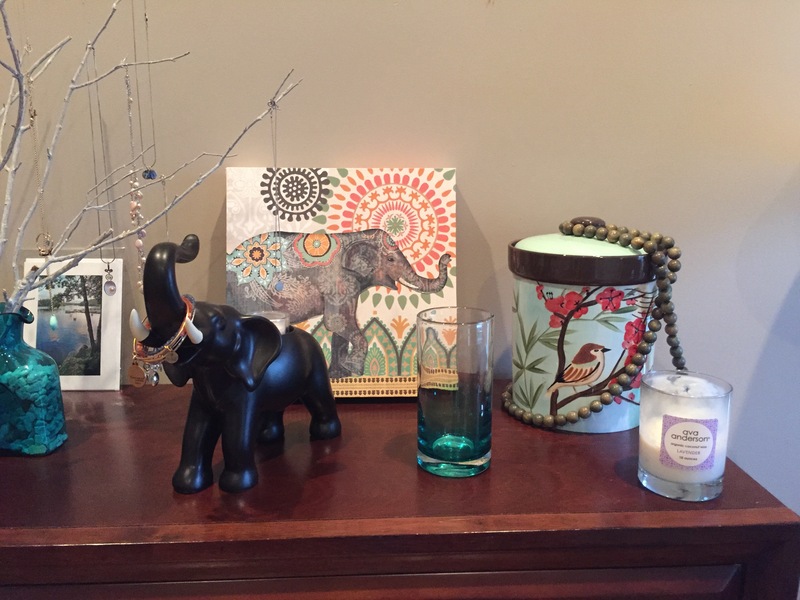 Since we bought our home 3 1/2 years ago, I haven’t felt like my bedroom was a haven for me. In our first year, it’s where we shoved all the boxes that we didn’t want visitors to see. 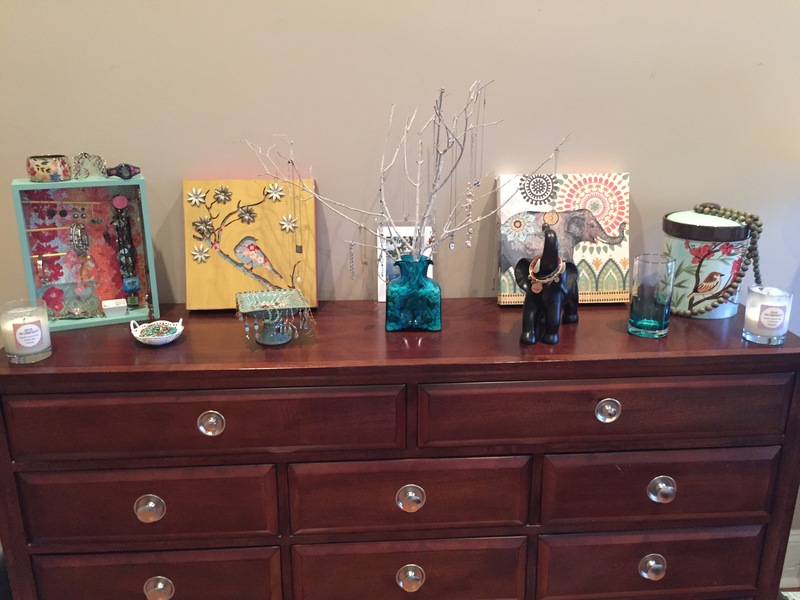 I finally moved the boxes out, but I still felt like it invited clutter. So I rearranged the furniture. I tried out different spots for the bed. I got new shades, and I searched high and low for yellow curtains. 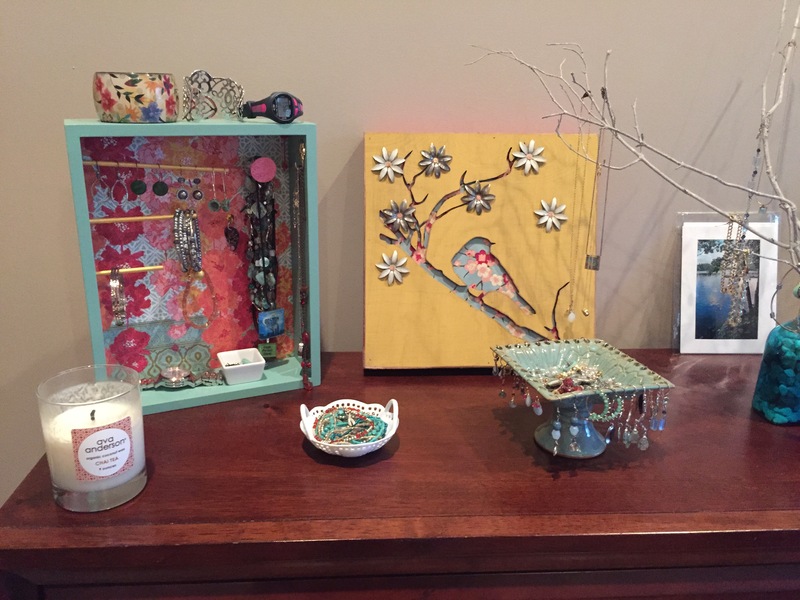 And then last fall, I realized that the focal point of my dresser, the beloved antique jewelry box I had chosen as a Christmas gift the year we bought our condo in San Diego–well, it no longer served me. It was dark, and what I am seeking is light. It has lots of drawers and compartments, but what I’m cultivating this year is expansion and maybe even a little bit of chaos. 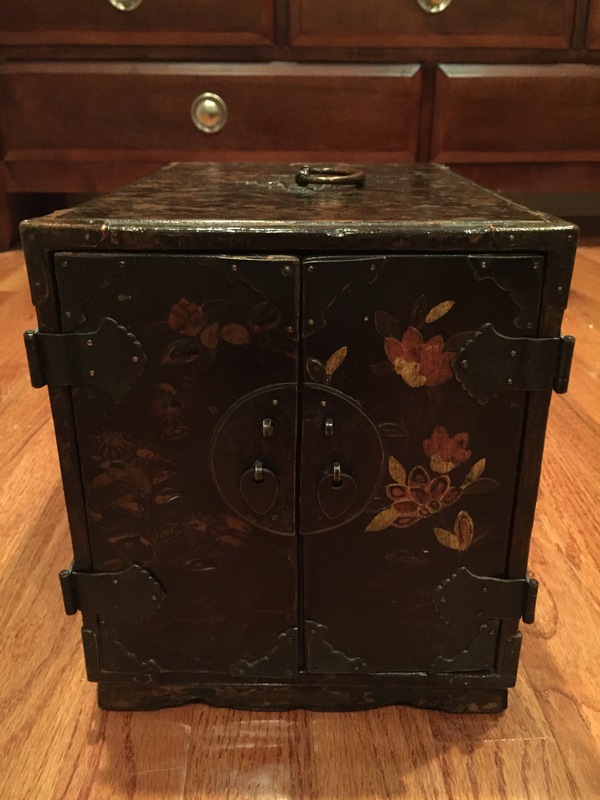 My trusty jewelry box has kept everything safe and secure for the past 11 years, but what I need right now is an open space where I can see all of my treasures. This entry was posted in Life Passages, Motherhood, Personal Growth, Reflections, Wellness, Year of Radical Wellness and tagged being in process, consciousness, creating the future, fulfulling dreams, Harvard, home, Institute for Integrative Nutrition, intentional living, intentionality, journey, organization, self-reflection, structure. Bookmark the permalink. Very nicely written Danielle! You capture an almost year of your life in words that paint a realistic picture of where you have come from and where you hope to be going. Thanks for sharing!